Proper noun: 1. the study of an extremely difficult, yet completely adorable baby named Rambo. Rambologic: adj./2. (n) confusing subject 3. (n) baffling project. It's real. Trust me. It's the newest thing out there next to the study of high end brand name products and soylent green. And the past 12 weeks have taught us that no one is by any means an expert in the field. As a matter of fact, no one even has a degree yet. We're all still in training. And the subject has been kicking our butts - until now. Cut a hole in his throat and we finally one up'd him. He didn't see that one coming. Rambo has had his trach since Wednesday the 23rd and he actually looks comfortable. And from my recollection its the first time EVER that we can say that. He is breathing without working too hard. He is smiling! He looks like a real baby. There isn't a need to keep him sedated anymore so he is waking up, looking around. And I really think that if he could make noises he would be. The best part is we can see his face!!! His wonderful beautiful face! His nurse said today that there is finally a dim light in the distance. An end is coming into sight. It may still be a way off but it IS there. Rambo has one surgery left to undergo. It will be to get his G tube and Nissen. 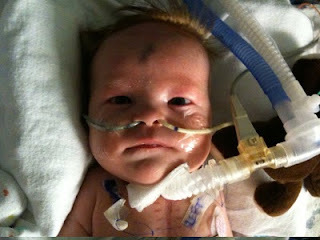 The G tube is his feeding tube and the Nissen is so he does not have reflux. He will get his first trach change this week by the ENT's and then Ben and I will learn all the in's and out's of changing/cleaning/caring for it. It's a little disgusting to think about. I love him and can't wait to bring him home. I just want to add that Rambo is a handsome little guy! Especially in the last photo that you posted! Prayers are with y'all! I should have called him cupcake. So you're sayin' there's a chance. "That could be a real life changer."